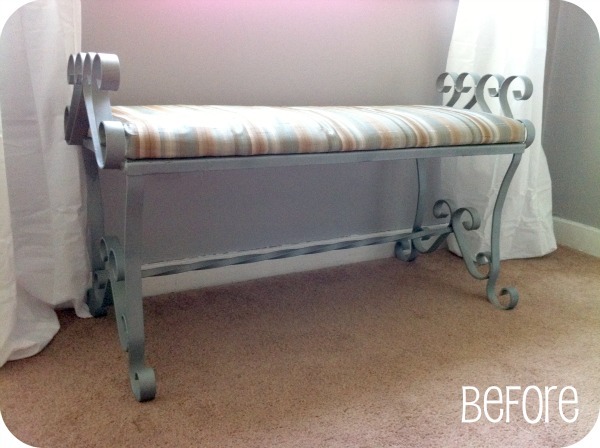 The evolution of a little bench! This little bench of mine was a craigslist find. 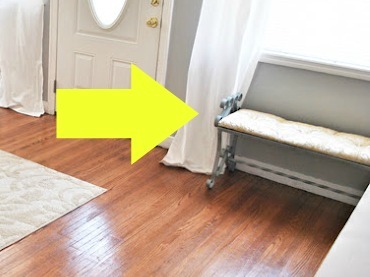 I knew I needed a bench for this awkward height window in my living room because nothing else would fit there and it would look awkward as an empty space. 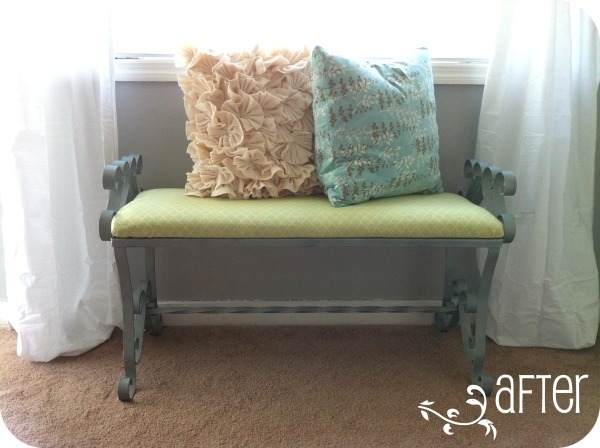 Later, I decided I wanted a richer looking fabric so I tufted the bench and used some really pretty yellow satin embroidered fabric. I liked it a lot. I realized I don’t have a photo of it since I didn’t share the bench redo when I tufted and reupholstered it. You can kind of see it here..
Then, madness struck home and I decided I needed more of my favorite colors and patterns in the living room after I refinished the wood floors. 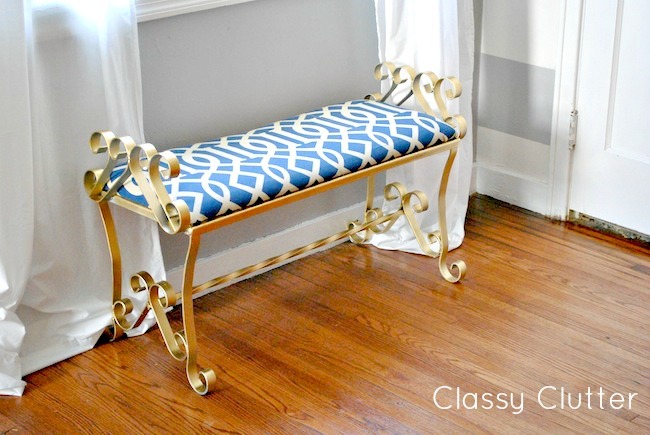 I sprayed it Rustoleum metallic gold and reupholstered it with some navy and white fabric from Joann’s with a coupon. Here it is now! Whew! I love it! 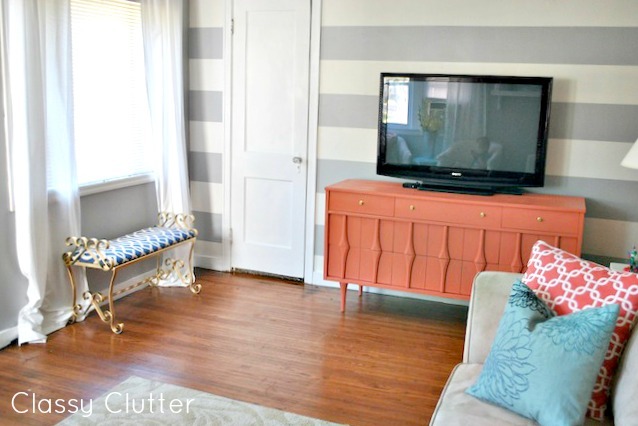 I am really getting excited about this room but I’m still struggling a bit with artwork above my couch. Any ideas anyone? I love the new look; it is definitely the best, and complements the other bright colors the best. Good job! Oh yes, very chic and modern now! Great work. OH it came out so pretty! LOVE the navy in contrast to the coral too! and the gold tone! I audibly sighed when I saw this. Came out beautiful! Great work! I love the last look! The gold and navy look fabulous together. Perfect color combo. I am usually not a gold kind of a girl, but I am ADORING your bench in its most recent state. I feel like I’m in Athens, looks totally Greek! Nice work! i love navy and gold at the moment, and i am loving this!!! looks perfect! I love the fact that you are not afraid to try something new and change something if it isn’t working. Sometimes I get so worked up over a project because I am worried I won’t like it. But I just need to remember that I can always redo it! Love, love, LOVE the new look!! Love the room! As far as artwork, I would suggest pick up a couple of blank canvasEs, craft paint of one or more color(s) and just play. The abstract, one of a kind look will be icing on the cake! I love it!! This is the best transformation by far! Gold is so popular now and it looks great in the living room! Thanks for sharing this at Keep Calm and Link Up! I’d go rustic over the couch, just to contrast the shiny gold! I love this room!!! 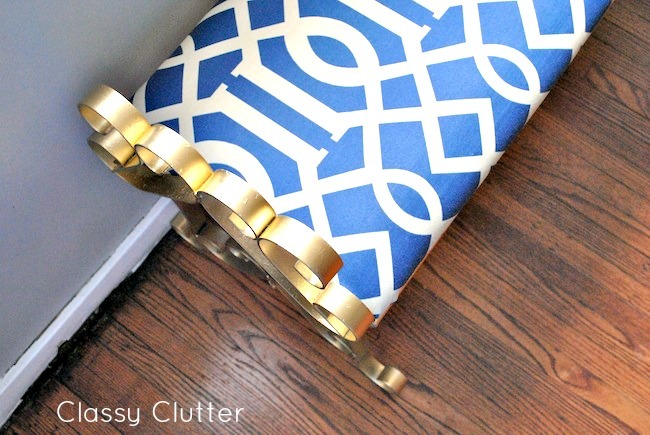 You can just redo your lamp shades, spray adhesive and fabric! !